Reflections on the UNDP Public Service Excellence and the Post-2015 Development Agenda workshop in Singapore, 17-19 November 2014. I’m keen to share some insights from an event I recently attended. 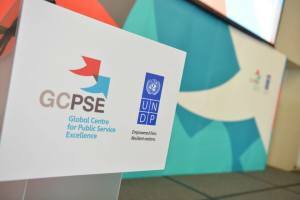 I was invited to the UNDP Global Centre’s three day ‘Public Service Excellence and the Post-2015 Development Agenda’ workshop in Singapore to facilitate a day of discussions on what public service might look like in 2030, and what we need to start preparing now in order to get there. The Sustainable Development Goals (SDGs) are just around the corner, and the development community must employ foresight to deliver them successfully – in particular SDG 16 around “effective institutions”. In the room were senior government officials, international experts, academics and development practitioners from all corners of the globe, with decades of combined experience. As a Westerner, I was rather keen to get out of the way and let dialogues and experience exchanges unfold. If public service is to stay at the heart of international development, the value of diversity in spaces such as this cannot be underestimated. The conference delegates were impressively diverse – 80 members representing 33 nations – and this presented an important learning opportunity for all present. During the second day, I designed the facilitated participative discussions exploring a world in which SDG 16 has been achieved – first by exploring the points of views of different types of citizens, then different parts of the public service structure in 2030. Not only is discursive participation the best way to engage delegates of very different experiences and backgrounds at a workshop, but it provides a fantastic medium for peer learning and real productivity. When it comes to discussing and preparing for the future, there’s no point in being prescriptive or rushing to establish an action plan because there really is no “right answer” – there are no “facts” about the future. Furthermore, every country and community is different. Part of the move away from top-down (failed) “models” of public service or governance reform, towards a nuanced and relevant approach, requires facilitated approaches where people can share insights on effective institutions and public service. It is only in this way that we can synthesize the key insights from the event: the need to stop being over-prescriptive in the domain of public sector reform, yet that Public Service Excellence is something that is and will become increasingly important to the delivery of the Sustainable Development Goals and a future word that we all want to live in. What do effective institutions look like? Despite the strong thrust against a “one-size fits all” approach, there was agreement across countries and backgrounds as to some of the important ingredients for Public Sector Excellence. A key theme arising from the conference was this: empowered public service staff who share a common vision, belief and passion are the bedrock of great public service. If future governments are to play a facilitative, stewarding role as opposed to their current directing function, they must be run by engaged individuals. Civil servants must be strongly connected to the citizens of their country and have an approachable, outward-facing attitude. Instead of being mired in bureaucracy, policy and process, they must feel empowered and able to respond in dialogues with the public. What this really comes down to is effective government structures that promote a holistic, truly participative approach to governance as opposed to top-down control. This is not to say that leaders do not matter; they are essential to the functioning of any operation – and especially need to be bought-in and supportive of reform. However, “leadership” doesn’t matter as much as we have tended to think it does; there are many other voices and opinions to consider and other sources of momentum and ideas. Part of this holistic approach involves breaking down internal boundaries. Governments can often end up working in silos, with staff focusing so much on their own department that they forget to identify how their goals overlap with those of other departments, and could potentially be achieved much quicker (and much more sustainably) in conjunction with the efforts of other teams. Such bureaucratic confines impede sustainable development, and all necessary departments must share a common vision for how public service works. However, it is not just internal boundaries that need to be worked across; the boundaries between citizens and government must similarly be broken down, so governments are able to effectively respond to the public, and most importantly: the public have faith that they are being listened to and are willing to work with governments to co-produce the futures they desire. An effective civil service must work to mobilise both citizens and non-state Actors to achieve positive outcomes for everyone. A third boundary is one that exists between governments, when they have real opportunities to learn from each other and work together. It is all very well coming up with grand visions for the future, but there’s a vast gap between where we are now and where we want to be. It’s also somewhat easier to just carry on doing what we’re doing, instead of adapting and evolving. The rich, dynamic discussions that came out of the Singapore workshop underlined that governments will inevitably face new challenges and changes over the coming 15 years. Nevertheless, re-shaping public institutions is much easier said than done. How do we close the gap between what we are and what we want to be? The first step is to engage government staff, civil society and the public. Communications on public service excellence are incredibly hard to get right, both internally and externally. Civil Services must engage their staff and the public alike by sharpening up their communications efforts. Selling or even broadcasting a vision of the future will never attract buy-in if people don’t resonate with the messages. This is where the importance of narratives comes in: shaping a strong narrative that motivates people will prove fundamental to getting to where we want to be. As trivial as it may sound, storytelling is a key tool that is not employed enough. We’ve talked in complicated policy equations and strategic recipes full of jargon, and that’s what’s got us to where we are today. Now, we’re facing a new direction and we need to employ new processes and institutions to successfully achieve our visions for the future. A fluid, motivated and empowered civil service will do wonders for global development, and the best way to achieve this is by connecting with people on a human level. That old adage that tells us to “focus on the journey, not the destination” is only half true. When it comes to international development, we undoubtedly need to focus on the journey and the systems and processes that will equip us for getting where we need to be. However, we must never let our goals leave that vision. We don’t know exactly what challenges the world will face in the coming fifteen years, but a lot of things will have to change in order for us to get where we want to be. To deal with these changes before they happen it’s important that we equip ourselves to respond to challenges quickly and effectively. Building the strong institutions we need will prepare responsive mechanisms that ensure we can resolve any problems and successfully achieve our development goals. Further information about the conference itself, including the presentation materials, is available here.